Meguna Naka was born in Kyoto, Japan and is currently a member of Quartet Amabile. With the Quartet, she has won top prizes at some of the most prestigious competitions including third prize (and special prize for the best interpretation of the competition piece) at the 65th ARD International Music Competition, overall Grand Prix and first prize in the ensemble division at the 10th Yokohama International Music Competition, and first prize in the ensemble division at the 12th Romanian International Music Competition. 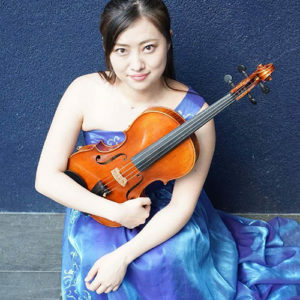 In addition to her chamber music performances, Ms. Naka has performed as soloist at the Indiana University National Contemporary Music Festival in the United States and, in 2016, performed with the renowned violist Nobuko Imai at her recital in Japan. Ms. Naka graduated from the Toho Gakuen Music College and currently studies with Walter Kuessner at the Hochschule für Musik Hanns Eisler Berlin. She also studies chamber music with Kazuhide Isomura and Nobuko Yamazaki.